It can often seem like there’s a straight line between simplicity and usability. But if we strip everything down to the bare essentials, do we lose something in the process? In our most recent UX Chat, we discussed a common concern of many businesses: how do you develop the same product for two (or more) different audiences? For this hour-long chat, Peter fielded questions covering absolutely anything on the subject of UX, from moving forward with your UX career, to building user personas, to cost effective UX testing measures. People project human traits onto everything — but now these objects talk back. Whether you like it or not, your users will still assign a personality to your bot if one hasn’t been explicitly designed. The tricks, hooks, and tactics Facebook uses to keep people coming back have gotten more aggressive and explicit. And that takes away from the actual value the platform provides. Despite the rise of the discipline, many UXers face lots of internal (and external) “enemies” that prevent us from securing the budgets and resources we need, being taken seriously and even being heard! Lee will discuss some of the most common enemies he’s encountered, and share how others have overcome them. 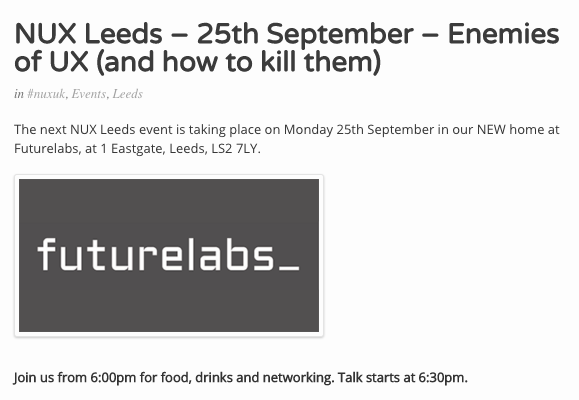 The next NUX Leeds event is taking place on Monday 25th September in our NEW home at Futurelabs, at 1 Eastgate, Leeds, LS2 7LY with UX research pioneer and long standing NUX friend, Lee Duddell of WhatUsersDo. Emotional design is the secret sauce of many successful products. Emotions are so powerful they influence our perception, decision making, and even memory — the more emotional an experience the better we remember it. The whitespace on a page, even though often overlooked, can be every bit as important as the space occupied by UI elements. Christina Wodtke walks us through Context, Architecture, Mechanics, Poetics (CAMP) as a unified theory for designing just about anything. The parallels between the principles of improv and the methods of IBM Design Thinking are staggering. Here are some of the ways to incorporate content throughout the design process. Let's start with the role of content in sketching and work our way up to polishing content in high fidelity mockups. Put on your content strategy hat — here’s how to spend your time wisely during each phase, using language to craft better experiences. Jared Spool is one of the most influential voices in UX. This episode focuses on finding out a bit more about how Jared built the enviable career he's now so well know for and what's inspired him to do it. 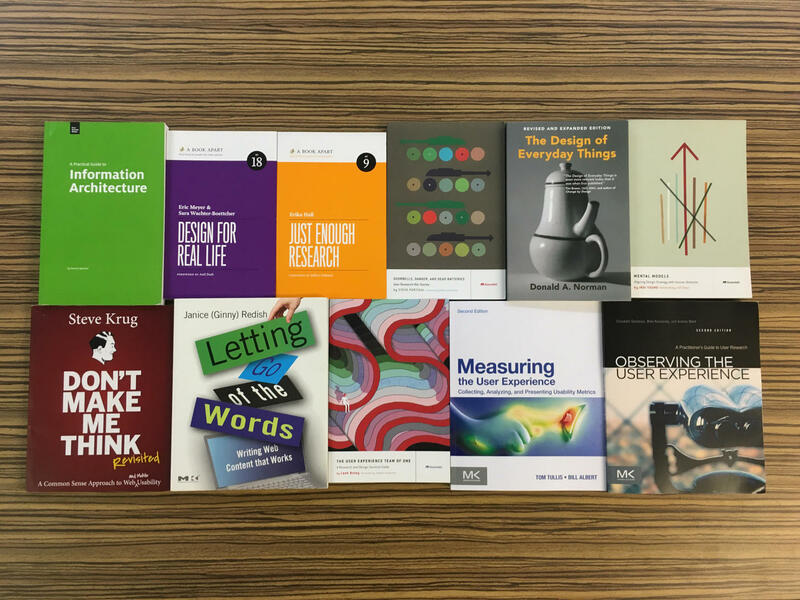 Hold it!✋ Want to win this entire UX book bundle (total of 11 books) from our UX Reading List? To enter, simply tweet this and tell us your favourite book from the list. Then you're done! Easy peasy.